To accomplish this I wrote an Arduino sketch that turns the Circuit Playground into a MIDI device and offers various “modes” that allow you to interact with the onboard sensors — capacitive touch sensors, accelerometers, lights, thermometers and others. 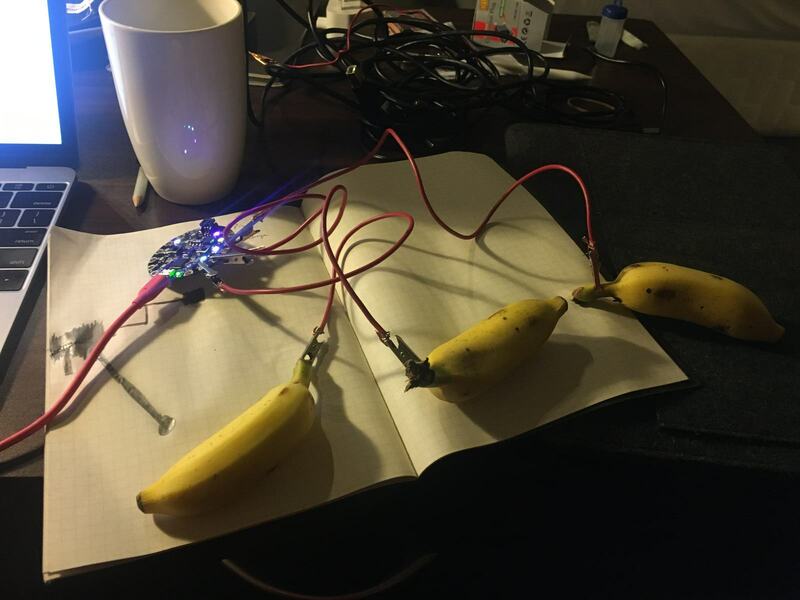 For example, one mode lets you use the capacitive touch sensors to make a banana piano. Another lets you mix RGB values for the built-in NeoPixel ring, and another simply relays the current temperature (in celsius) from the thermometer over a repeating MIDI message. The documentation explains how to upload the sketch to your device and what the various modes do. In the future I hope to add photos and videos that illustrate how to use the thing a little more clearly, create more examples and of course would like to improve on it’s functionality. It was only my second time trying this as a workshop and I’m mostly happy with how it went. The attendees were enthusiastic about it and impressed me with some of the projects they were able to make in the time we had. They also gave me good feedback I’ll try to use to make the workshop better in the future. If you’re interested in having someone come and give a WebMIDI workshop at your conference, event, school, business or wherever, please get in touch!